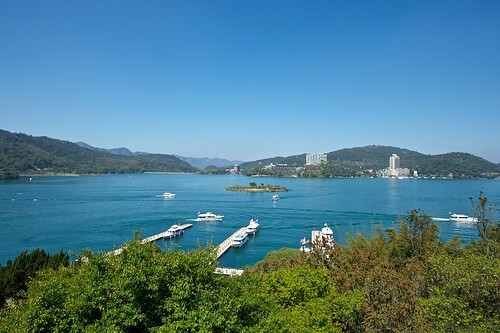 Sun Moon Lake (日月潭) is one of Taiwan’s most popular weekend getaways. It’s a large, stunningly beautiful lake conveniently nestled in the Central Mountains. It has almost everything you could want in a weekend escape: from family friendly camping to five star hotels; adventure and exercise to spas and relaxing; and of course lots of culture and beautiful lake views! The last time I visited Sun Moon Lake, I was only able to stay for about 24 hours, but in that time, I was able to see and do quite a few awesome things! Today I’m going to write about three places that can be visited in a half day: Syuanguang and Syuanzang Temples, and the Cien Pagoda. All three are connected by the short Mt Cinglong Hiking Trail (青龍山步道) that starts at the Syuanguang Temple’s pier and continues up to Syuanzang Temple and on to Cien Pagoda (You actually have to walk on the road for a short time, but it’s still quite nice). 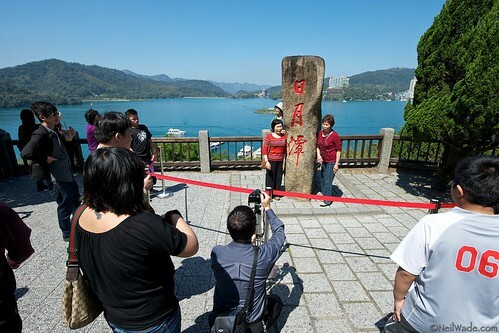 For more information on Sun Moon Lake (日月潭) visit Taiwan Adventures Travel Guide (跟著老外玩台灣). The beautiful Cien Pagoda stands towers above Sun Moon Lake in Central Taiwan. 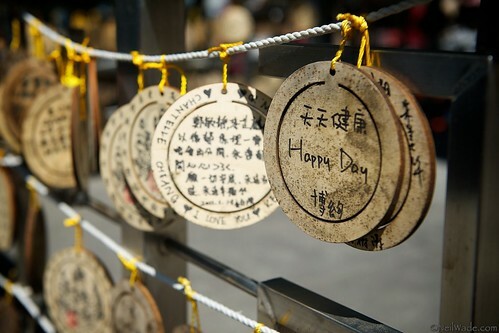 First stop on the circular road that surrounds the lake was the Syuanguang and Syuanzang Temples (玄光寺, 玄奘寺 ). 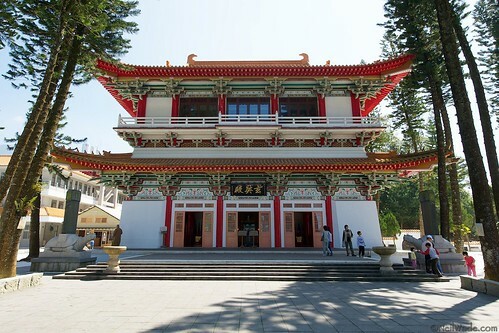 Both of these temples are dedicated to the famous Buddhist monk Xuanzang, who is credited with greatly improving the knowledge of Buddhism in China in 645. His epic journey from China to India and back again is well known amongst any predominantly Buddhist country. It is also the basis for one of Classical China’s most famous novels Journey to the West. 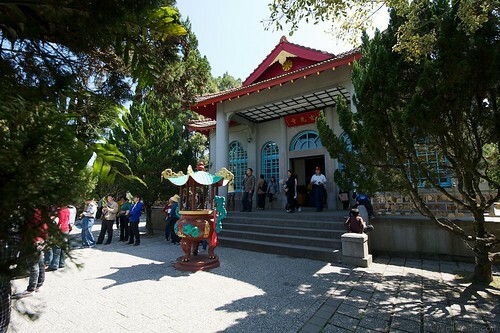 The Syuanguang Temple is the more famous of the two, and is often mobbed by tourists wanting to have their picture taken by the famous rock that says 日月潭 (Sun Moon Lake). The temple itself is quite modest, and has a slight Japanese feel to it, including small wooden places with wishes written on them. The temple is famous throughout the world because it has a bone fragment of Xuanzang, a highly revered item from any Buddhist master. 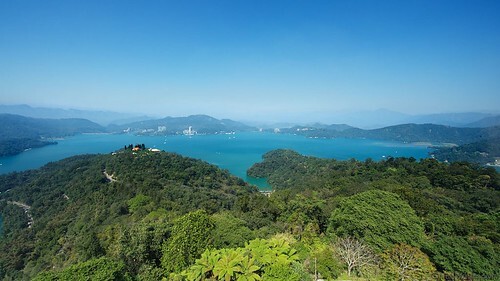 The temple also has one of the best views of Sun Moon Lake as it sits on a peninsula jetting out into it. The Syuanzang Temple sit a bit farther up the hill and can be accessed by the road or a short hiking trail from Syuanguang Temple. It is a much more peaceful place, with tall Cypress trees and immaculate grounds. It also has nice views of the lake, and a few souvenir shops along the road. Syuanguang Temple has some awesome views of Sun Moon Lake. Syuanguang Temple is a fairly simple building with a mix of Japanese and Chinese architecture. 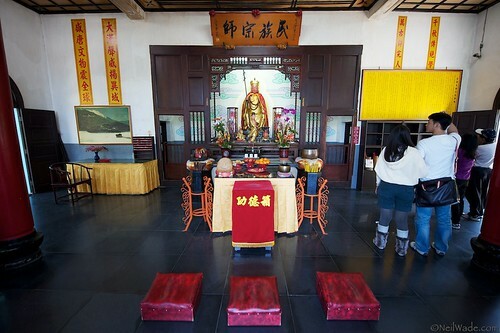 The Syuanguang Temple on Sun Moon Lake is said to have a relic of the ancient teacher. The Syuanzang Temple is a short distance from its more famous cousin the Syuanguang Temple, is quieter, and has equally awesome views of Sun Moon Lake. 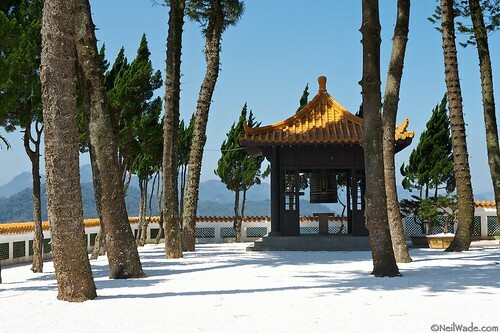 The Syuanzang Temple is a peaceful stop on the Sun Moon Lake loop. Up the hill from the temples dedicated to Xuanzang is unmistakable Cien Pagoda (慈恩塔). Its distinctive shape can be seen from almost anywhere on the lake perched on its high hill top. It offers even more awesome views of the lake and surrounding mountains, but this time in a dramatic 360° fashion! The 46 meter tall tower is well worth a climb for the views, and there’s also a giant bell at the top that visitors can ring at their whim (for better or worse… be gentle!) There’s also a rest house that was often used by Chiang Kai Shek, but it was closed when we visited. The 700 meter hiking trail from the parking lot and nearby temples is a nice walk and is said to be an excellent place to see fireflies in the early summer. We heard monkeys jumping around in the trees when we were there, but didn’t get a picture. 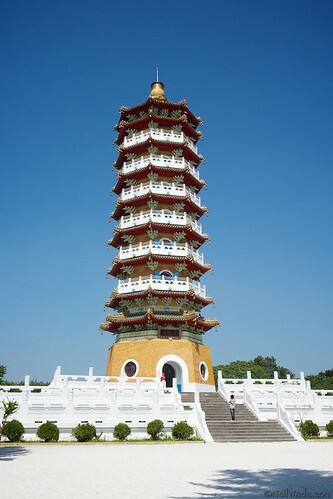 The best time to visit Cien Pagoda is early morning, when you have the best chance for a clear view of the lake. If visiting in summer, the cooler morning temperatures will also be welcome on the uphill hike! 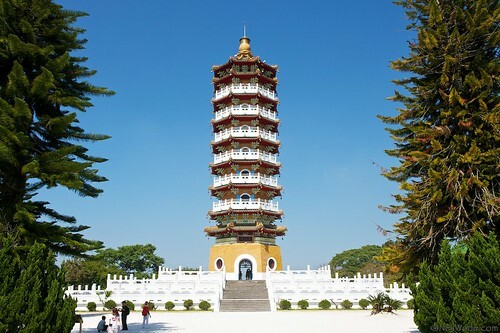 The pagoda is accessed by a small parking lot, the round-lake buses, or the easy Mt Cinglong Hiking Trail, which starts from the Syuanguang Temple Pier. 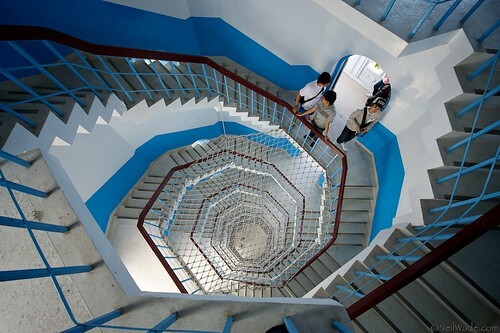 A tall spiral staircase will take you to the top of Cien Pagoda. Be warned! 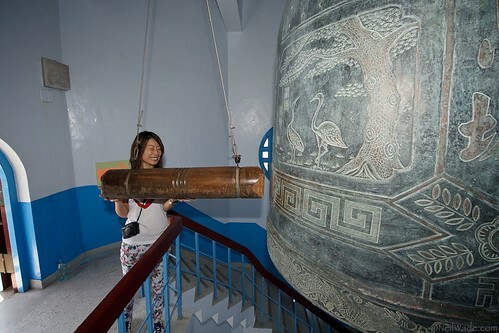 The giant bell at the top of Cien Pagoda in Sun Moon Lake, Taiwan is LOUD! The view of Sun Moon Lake from Cien Pagoda is unbeatable. 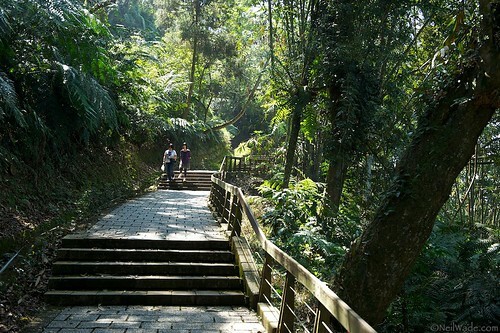 The Mt Cinglong Hiking Trail is an relatively easy walk from the Syuanguang Temple Pier up to the Cien Pagoda. Nice photographs Neil. I think Cien Pagoda is the only attraction there I haven’t visited. I’ll have to check it out next time I’m there. Brilliant photography! Thanks for sharing these photos. I will bookmark your website. I really like your photos, I have to admit that you are a great photographer. Keep up the good work and hope to see more amazing photos from you. I really enjoyed your blog. It made me miss Taiwan a lot.